Multilane sachet machines are used in a multitude of industries for powder and liquid products. Sealed on all four sides, these small packets are often filled with condiments and spices like salt, sugar, mayonnaise, or ketchup. 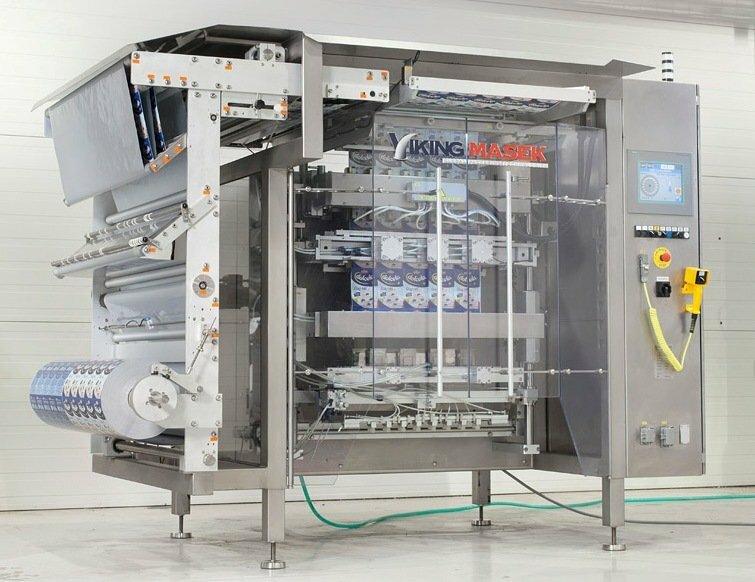 Manufacturers and contract packagers love sachet packing machines because they can achieve high throughput while occupying limited floor space. Sachet machines use a single sheet of film material would around a core, usually referred to as rollstock. The film is unwound by motor driven rollers from a reel that is located at the rear of the machine. 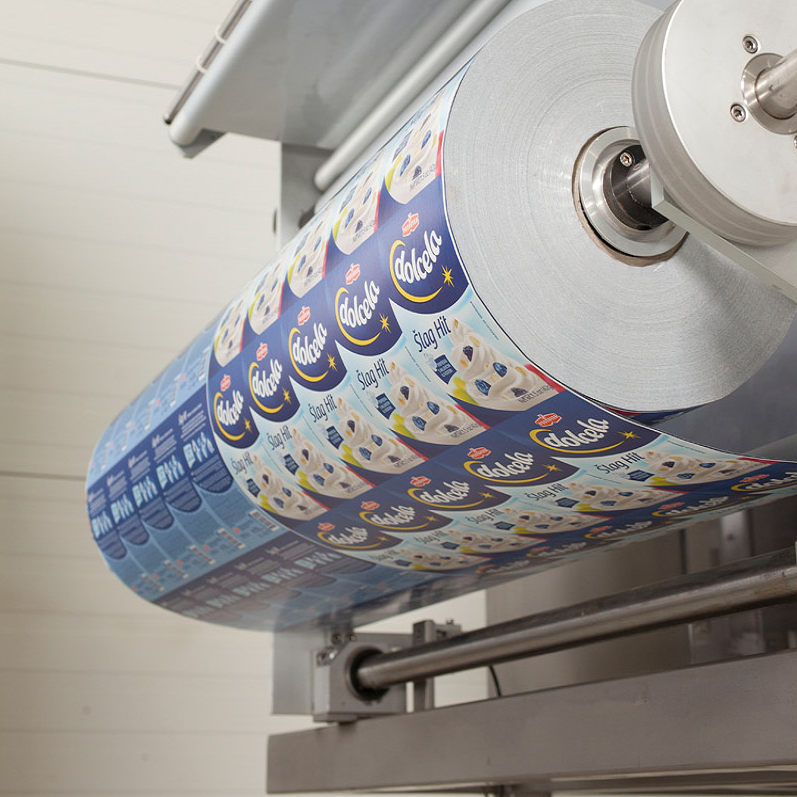 If the sachet packaging machine is equipped with a date stamping device (printer), the film is fed over a sliding roller that registers the position of the date stamp on the package in relation to the horizontal seal. The film is threaded over a sensor that reads eye marks and controls the position of the horizontal seal in relation to the printing on the film. Next, the film is fed through a set of braking rollers to keep even pressure on the film, keeping it in constant tension. This is necessary so the film does not “travel“ from one side of the sachet packing machine to the other. The film edge is tracked by optical sensors located in the upper part of the machine. These sensors detect when the film is wandering off-center and automatically re-centers it. It is vitally important for the film to be perfectly centered and at the proper tension so when it comes times to seal and cut the sachets into individual packets, it is done with accuracy and precision as related to the film and its graphics. Immediately after that, the film is divided with a disc knife into two halves (front and back). The rear half of the film runs under the sensor that reads the marks on the film and controls the position of the cross seal with regard to the film print. The front and back halves of the film are then folded to meet again with the print facing outward. Next, the film is pulled over shaping strips to form the sachets. These strips are fitted with smoothing brushes to better shape the packets. The liquid or powder product is then dispensed into each sachet by round tubes or flat nozzles. A special bag straightener can be employed at this step to make sure the packets are perfectly straight prior to cutting. Next, sealing of the sachet packets takes place. Both sets of sealing jaws are heated to bond the front and back sheets of film to one another to create sealed packets. The longitudinal (vertical) vertical seal jaws first close in the space between the filling nozzles or tubes. Then, the cross (horizontal) seal jaws close to form the bottom seal of one packet and the top of the next. This creates the distinct 4-side-seal look of the sachet packages. A group of pneumatically-driven disc knives can then cut the film vertically if individual sachets are desired. Perforation knives with an intermittent edge can be used for creating pairs or triplets of packets divided by perforation. 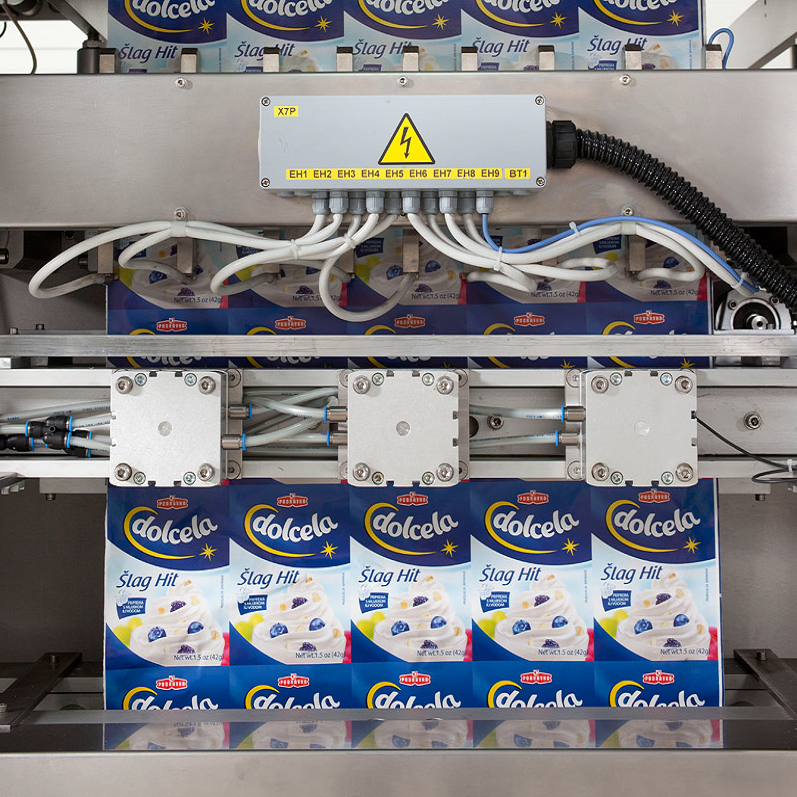 A horizontal cutting station then separates the filled, sealed, and longitudinally cut packets into individual sachets. Finished sachets drop into an outfeed chute that deposits the bags either onto an outfeed conveyor or directly into a receptacle. Alternatively, and Pick & Place device can be used at this point. This device uses vacuum suction to lift individual sachets, turns them by 90 degrees, and places them onto a special outfeed conveyor. This conveyor has individual lanes that guide each sachet downline. 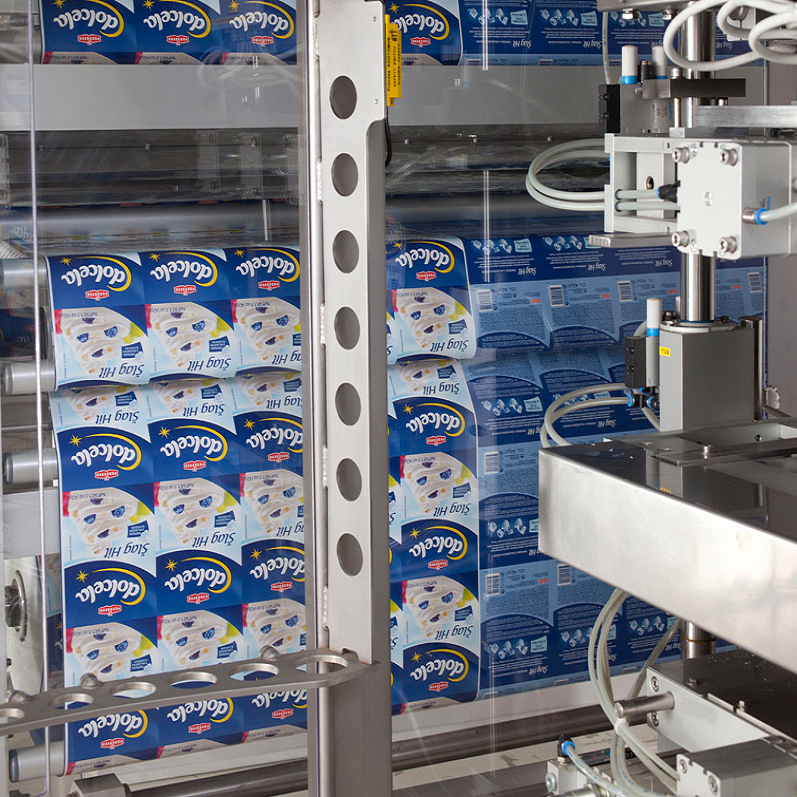 Often sachet packing machines are also integrated with case or carton packing equipment that places individual packets into outer cardboard cartons, and those cartons into larger boxes. Originally published 11/21/2017, updated 4/26/2018.